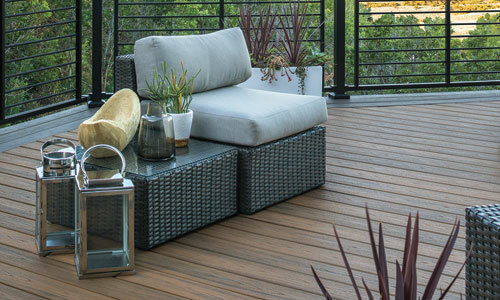 Trex Decking | International Wood Products, LLC. When it comes to composite decking you have lots of choices. But only one choice offers you the world’s #1 composite decking brand – Trex. Since 1996 Trex has invented, defined and perfected the composite deck category offering a full complement of low-maintenance, high-performance, eco-friendly products that fundamentally change the way we live outdoors. Trex invented the category, but didn’t stop there. That same low-maintenance innovation is available in Trex railing, outdoor lighting, steel deck framing, deck drainage systems and more, creating an entire Trex system of outdoor living. Trex decks will not rot, warp, or crack and are insect resistant. This quality is supported by a 25-Year Limited Residential Warranty, and the added 25-Year Fade & Stain Warranty provides an additional layer of protection and increased piece of mind. IWP is proud to supply Trex products to the market; we are confident that when you choose Trex you are on your way to an amazing outdoor living experience.